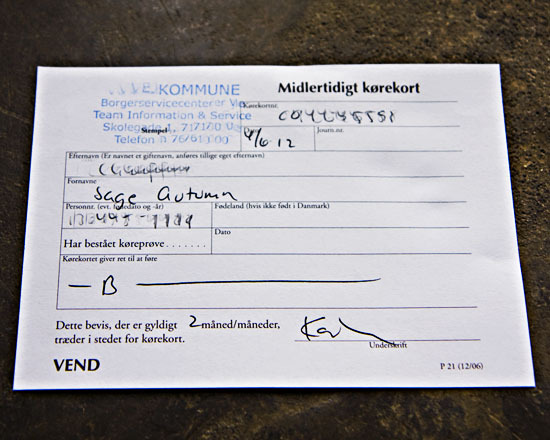 If you’ve been reading my blog for awhile, you might recall the drama of me trying to get a Danish driver’s license. I eventually gave up, but I’ve been without a car for two years, and it’s obvious that I need a car, or else I need to leave Denmark! So, I jumped back into this hellish process, waiting six weeks for an appointment to get the all mighty “Doctor’s Certificate,” which is the key to getting this whole thing going. Anyway, I took today off from work to go to the Kommune. I thought I had all of my ducks in a row, I was planning a quick in/out scenario followed by a little shopping, but as I should’ve expected, it turned into quite an odyssey! So… I found a photo shop that makes license photos, but I’ve seen nicer mug shots. So, I went home and tried my luck with the tripod and a timer, ending up with something between the pretty flippy hair photo and the mug shot from the photo shop. I popped it onto a USB stick, pedaled back downtown to have it printed, but my stick is formatted for Mac and their “system” only recognizes PC. In 2012, seriously? Back home to submit it online på dansk, back across town to the shop, where they couldn’t find the file. Finally, it turned up in the queue and soon, I was on my way back to the Kommune, with 45 minutes to spare before closing time. There might’ve been a few tears and a lot of swearing (to myself and those closest to me, not the Kommune people or the photo guy) but, I’ve got a 2 month temporary license!!!! But do I dare buy a car? Given my track record here, it’s not out of the question that I’d buy a car, fail the test 5 times, then have to donate it to charity, and leave the country for mental health reasons. Despite an official website stating the contrary, my driving instructor insisted that I needed to pay 1200 kr. (about $225) for a translation of my license. You only need the translation if the license is printed in non-western characters. He also insisted that since I’ve been living in Denmark for “some time” it was not possible for me to have a temporary license. This is obviously not true. I know it seems impossible at times, but do your best to ask questions and do your own research because you can’t always trust people, even the people you are paying to help you. If I’d just taken his word, I’d be out 1200 kr. unnecessarily, and I wouldn’t have a temporary license. Hello from another American about to move to Denmark (with my Danish husband, who has been living in the U.S. for the last decade)…I’m going to be faced with this issue of trying to get a new driver’s license once we’re there and I’m not thrilled about it. Thanks in advance for chronicling your own, errrr, adventures through the process — it’s helpful for me to know what I’m getting myself into. We’re actually shipping our (automatic) car…but I understand the driving test has to be done on one of their cars, and that means only on manual transmissions — is that so? I learned to drive 25 years ago on a manual transmission car but the experience scarred me so I have a mental block against them! Have you fully researched the car importing process? I want to import my Audi TT, but I’m told that it’s going to be very difficult/nearly impossible since it’s from outside the EU and therefore is missing some sort of engine badge with the EU-equivalent of the VIN. If you have other information, I’d love to hear it, because selling that car is breaking my heart. i´ve been through the process, and it is quite annoying. first i read it was not needed to translate my drivers licence from portuguese to danish, but when i got to the kommune i was said it was needed and had to pay a high fee to a danish translator that was certified by the police. But the picture is by far the most annoying part. went to a shop and ask to the specific kind of picture only to find out after at the kommune that the picture was 1mm too small. Serious! About shipping your car, take a look about the fees first, because you are gonna have to register ou car in denmark, and for what i have heard, the money you are gonna have to pay in those fees, it is better to buy a car in denmark. serious, it is nonsense!!! You’re right, importing a car probably won’t save much if any money. That’s not even taking the hassle into account! But I’m not looking to import the car to save money, I’m doing because I want to keep the car and I can’t continue to store it in the US. I’ve left the researching up to my husband, who has been plowing through the Danish regulations (in Danish, natch) — so far what he has uncovered is that we shouldn’t have a problem with our Honda CR-V, but I’ll bring it up with him again tonight. He hasn’t run into anything noting that a car from outside of the EU would be a problem, but we’ll double check that. He has found some online calculators to give an idea of the registration fees associated with importing specific car makes/models, and we are looking at about $25k (U.S.) for registration/taxes/etc. Ouch. Yet from what we’ve been able to glean online, that seems more affordable than trying to get a comparable used car (on the larger side, as we have 2 kids in the back) once we are there. We could also import our 10 year old Subaru Forester for only about $5k in registration/other fees, but it’s smaller and has fewer safety features than the newer Honda. We’re assuming the Honda would at least have better resale value 5 years down the line (when we’re looking to leave Denmark).